Often times, the grass on the other side of the fence looks greener – but what if it was your grass that was on the “other” side? A healthy lawn is probably one of the most important features when it comes to gardens, and something many of us desire to have throughout the year. Getting and keeping your grass “greener” requires constant effort, and a lot of know-how… but don’t despair, we’re here to help. Keep an eye on the green. This is the key to unlocking a beautiful garden. 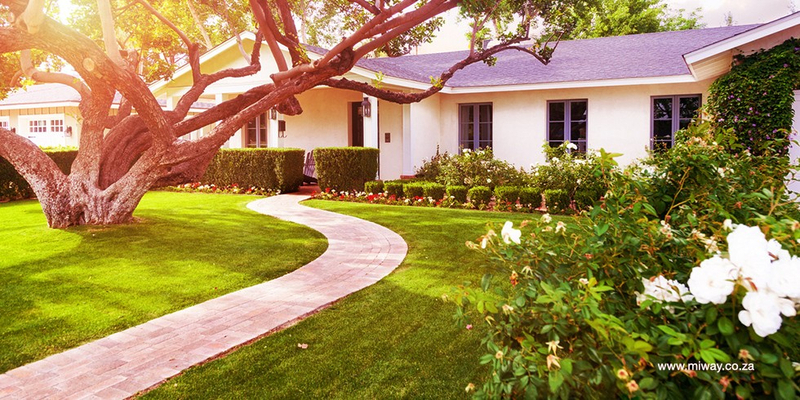 If you notice that your grass is browning, or identify a few brown patches, it’s time to give it some TLC or water it. Watch the water. Don’t over-water your grass or water too frequently. With the water crisis facing the country, and depending where you live, you’re probably looking at giving your lawn about 20 to 25mm of water a week, in two cycles. Try to water either in the morning, or if not possible, in the evening (to avoid losing water to evaporation). If it rains, watering will obviously not be necessary. Ration out the watering. Avoid watering your lawn too frequently for short periods each time - this may result in poor root formation, as the roots do not need to penetrate the soil deeply due to the water always being on the surface. Be consistent with your schedule. Work out a timetable for watering your grass for the different seasons and stick to it; this way you will know when you have watered it or when it needs to be watered. The consistency will help you identify other problem areas as it rules out a watering issue. How low can you go… Short grass may look appealing and “easy” to manage; however, you do not want to mow it too low. Keep your mowed grass at about 50mm in height. How often you mow will also depend on how fast it grows. This depends on the time of the year, how much water the lawn is getting, the temperature and the general climate. Let your grass breathe a little. Aerating your grass, especially in springtime, will bring with it a number of benefits, some of which are: improving the soil’s quality, reduced compaction, and the roots take up water and nutrients more efficiently. Bonus tip: Lawn clippings make a great mulch for roses, as well as a great base for compost. Using lawn cuttings is an economical and natural way of feeding your garden, so make sure you collect the cuttings and add them to a compost heap. You can even supplement it with organic waste from your kitchen by adding vegetable peelings, eggshells and coffee grinds for a home-made compost that’s rich in nutrients - and cost-effective too! Now that you’re equipped to keep your garden looking good throughout the seasons, why not let MiWay take care of the rest? Contact us for a home insurance quote or to insure those useful tools that help you keep your garden greener.